The official March temperature figures are out. And remember, these are the official figures. With the poor placement of stations (91 % of the stations are CRN 3 to 5 = bad to very poor); where they have purposely taken away the urban heat island effect, use huge smoothing radius, the historical “adjustment and tweaking” to cool the past etc. Catastrophic Climate Change – All human activity ceased in Florida and Georgia! This year, the March temperature is – 6.6 F cooler than 1910, the warmest March. 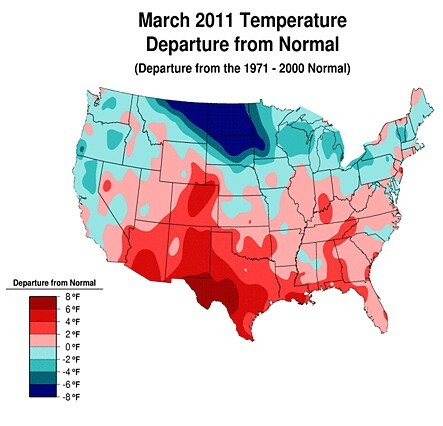 And if we compare this year’s March with 2007 it is – 4.49 F cooler. If we compare with 1946 this year’s March is – 3.96 F cooler. And if we compare with 1921 is – 3.64 F cooler. 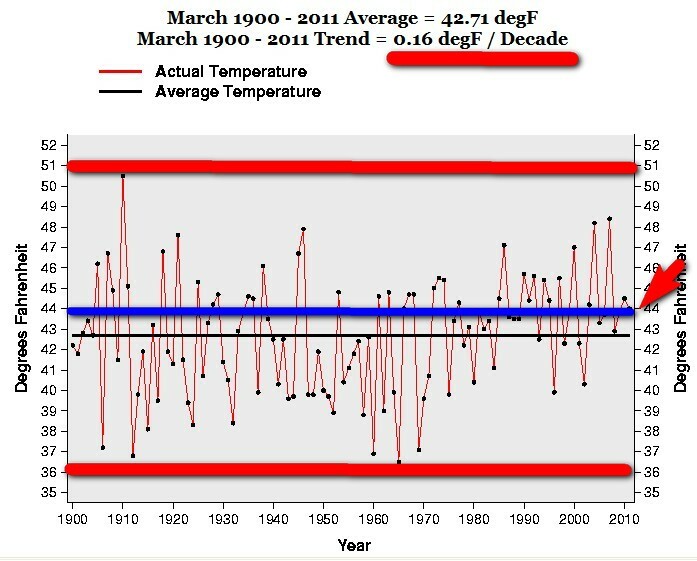 And the “warming trend” 1900-2011 is exactly 0.16 F degrees a decade. That is a whopping 1.6 F warmer in 100 years. Take cover! And notice the dramatic rise from 1906 to 1907. A rise of 9.47 F degrees. And the dramatic rise from 1910 to 1911. A rise of 9.07 F degrees. Or the rise from 1960 to 1961. A rise of 7.69 F degrees. That’s what I call RAPID WARMING and an eminent treat to humankind! And we all know what happened – USA ceased to exist because of this catastrophic rise in temperature. Except it didn’t – nothing happened. Everything went on as normal. There are other years in the chart when the temperature increases 6.77 – 7.52 F in one year. And still, somehow mysteriously, USA went on as normal. So a “predicted” rise of 3- 4 F degrees in 100 years is a total catastrophe for humankind. But an ACTUAL RISE OF 9.5 F degrees IN ONE YEAR is nothing. Interesting ”science” wouldn’t you say. This entry was posted on 10 april, 2011 at 4:04 e m and is filed under Fri- och rättigheter, Miljö - Environment, US Temperature, USA, Yttrandefrihet. You can follow any responses to this entry through the RSS 2.0 feed. You can leave a response, or trackback from your own site.